Why would we talk about “Fortune Favors the Bold” in a chairmaking class? Next time you spend three days working on a piece of soft pine trying to make a Windsor chair seat out of it and the instructor tells you to take a drawknife and make big honking cuts on the edge of the seat with it, you will know what I mean. It took a lot of guts to cut that seat. We spent the morning of the fifth day carving out the seat to our chairs. 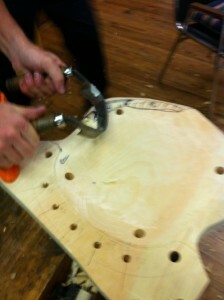 We started with the scorp and carved a round portion near the back of the seat. Peter did one as a demo in about 45 seconds and then we spent about 45 minutes trying to make ours look like his. After that, we worked on another part of the seat and then tried to look at the whole thing to make it symmetrical and even and not have something people will not sit on. It is harder than you think. The travisher came next to smooth it out some more. Next we moved to the bottom edge and cut a bevel which runs up to the top edge and if you mess that up everyone will come along and run their fingers along the edge and say, what fool did this? That’s the part that needed boldness. We spent the rest of the day smoothing the seat, shaping the spindles for the back and getting ready to attach the legs tomorrow. 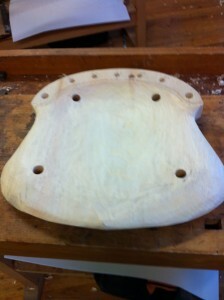 I surely do hope this chair comes together since we only have two days left to finish it. Wouldn’t want the one-eyed guy on the horse to laugh at me. 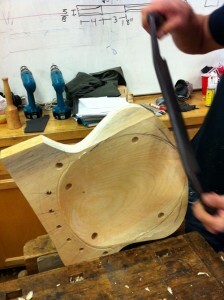 Click here to read about Day 6 of Peter Galbert’s Build a Windsor Chair class.